I chose to work from home. Moms like me get to stay in the house for a variety of reasons leaving the 9-5 routine working shift behind. When I became a mom, I figured that my little buddy here needs lots of attention, time and care coming especially from a mother. The special bond I have created with him since he was inside my womb is far no one can ever imagine. So, I made my choice and start finding out the ways of working from home online. It is a choice that is very hard to make. They say once you are deciding to be a stay at home mom (and even dad too!) you have to carefully consider the pros and cons that come with it. So, let me share that with you here. With your organizational skills and time management, you will get through it all and manage to be the best mom and wife at the same time making your ends meet. You will be able to enjoy and bond with your children and see them from time to time without restrictions and not having to juggle your work with your personal life. It is true that time begets love. And you are actually making yourself always available to your loved ones, especially during tough times. You won’t have any problem with attending the baseball tournament, PTA meeting, ballet lessons gala and other kids stuff fun activities. You got your own rules, policies and work system. When you got a job online you can work based on your flexibility and be available to accept other contracts and online job offers as needed. Whether you are in affiliate marketing or doing freelancing jobs, you are setting yourself up for a success. It can be challenging but it is all worth the ride especially when you are reaping and harvesting the fruits of your own labor. The freedom to choose whatever niche you are excellent with will give you more contractors and job offers to make yourself look reliable and expert in your own field. You just need to have the passion and drive to succeed in any of your online ventures. Follow it and you will never get lost on your way as you build yourself up. Keep yourself motivated and updated. Join webinars, strive to learn new things every day. As long as you have a good internet connection you can work wherever part of the world and whenever you can. Sure, there are online jobs that you will be stuck with some required time zones but you can always work it out. There are also a variety of jobs you can work with that just give you a specific number of hours in the week you must meet. So, it really depends. For freelancers and those who work using an online working platform like Upwork, Fiverr, etc. they are free to adjust their freelancing rates to whichever they’d like to base on the type of job or contract they are going to have. At this point, you got to consider contracts or work if they offer long-term or short-term contracts. On my part, I decided to start as lowest rate, like $3/hour (that excludes service fee, tax, charges, etc.!! So, you are free to imagine how much I earn when I got started!) But, don’t be too fussy about this as you will earn in the long run, trust me on this! You just need to have the patience, good working attitude, and perseverance, and everything will just go fine. It’s not always rays of sunshine when you chose to work from home. Let me discuss some of the bad things that come with it. Filing taxes will not be an easy-peasy thing to do when you work from home. Yes, indeed. Government always think you are a bad guy that you are not going to declare your earnings accurately. So, what I suggest you do is, keep the receipts every time you purchased something connected with your working online. I purchased my own software, TurboTax and it comes with a help desk/contact center that can assist you when filing as self-employed. The software automatically asks you some things you need to fill up. If you want to make it sure, you might want to ask help from a representative or an authorized person who do taxes. He can also give advise whether how are you going to file and claim taxes. It’s gonna be a tedious task but you should know that you are not running away from any more charges as you are facing deductions on your own while you are earning right? Maintaining a harmonious working relationship with clients and keeping the good ones. Some clients are not always the good guys. Yup, you will encounter some clients that are very demanding, not so very cooperative and the most irate and the worst thing you could ever think of. Some don’t give you the freedom of your own liking to work, others will require you to work in their time zone so you really have to smart too in choosing your own clients. If you don’t like to work with a boss or in an online working platform, there are some other ways too on how to make money from homes such as building your own website and affiliate marketing. 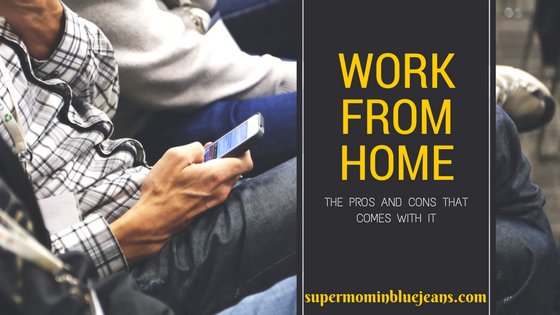 Are you working from home too? Or interested to be one? I would love to hear from you. Please feel free to share your thoughts in the comments section below. On Being Back to Work – Every Moms Biggest Decision Upwork Review: Why is it worth so much? I think no matter what you do in life there are always pros and cons. Who wouldn’t want to be their own boss, work as and when they choose and also spend more valuable time with their family? Working from home really comes down to common sense. But I’d say to get the most out of working at home, the best way is to build an online business so you can choose your own income and accomplish your goals. I absolutely agree Neil! Thanks for dropping by!